Along with your 2008 new year's resolutions to drink less beer, start all over again, pull up your socks, clean your shower, not live by the clock, get up at a decent hour, read more books, keep up with the news, learn how to cook, spend less money on shoes, pay your bills on time, file your mail away everyday, drink the finest wine and call your gran every Sunday, you probably want to lose weight. MSN Netherlands feels for you and has compiled a free Messenger theme pack that keeps your mind off the (pi) and the (^) and gives it a fruit boost instead. Included are one conversation window background, one dynamic display picture (with 3 moods) and five animated emoticons. 1) Click the "Volgende" button. 2) Untick the two options ("Stel mijn...") if you don't want to mess with your IE settings. 3) Click the "Accepteren" button. 4) Your Messenger is now getting its fruit injection. >> Download the Fresh Fruit Theme Pack (or get it from its homepage). >> Or you can surrender to your appetite and browse our rich-in-calories static food & drinks emoticons and animated food & drinks emoticons. >> Another free emoticon pack that people keep reporting is the Fun Family Pack. It's "sweet" as well, so check it out. Earlier this week Microsoft competitor AOL added something to its newest AIM beta which certainly puts the "instant" in instant messaging. Built with the help of the Gallaudet University and the Trace Research and Development Center at the University of Wisconsin-Madison, the Real-Time IM feature allows you and your buddy to "see what the other person is typing in real-time, as it is being typed, right in your IM window". So instead of just being notified when the other "user is typing a message", you can watch conversations unfold one letter a time. Personally, and I'm sure I'm not alone, I wouldn't like to see this sort of thing added to Windows Live Messenger. There are many reasons why an estimated 20% of composed instant messages is never sent, the difficulty of putting one's thoughts into words to name just one. Then again, the feature is not targeted at me but at deaf and hard of hearing users (more than 32 million American adults), who often rely on IM for everyday communications. "[Real-Time IM] enables deaf users to respond and react to words as they are typed just as hearing people would do as words are spoken in a voice conversation." Luckily, the feature first has to be activated (and accepted) for each conversation, and can be turned off at any moment. Also, both ends need to be using a compatible AIM client (i.e. v6.8+). >> Discuss on our forum. Our diss and war emoticons not rude enough? Messenger's nudge button not physical enough for you? Then maybe you should consider planting the USB MSN Missile Launcher next to an unknowing Messenger contact and bombard him or her with its foam missiles from a safe distance. 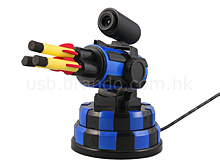 The sadomasochistic toy's built-in webcam in combination with the bundled remote control software allows you to aim and shoot the cannon at ennemies up to 15 feet away, accommpanied by explosive sound effects. Being a gadget that truly allows you to "mess with messenger", I preordered one right away even though its US$49 price tag is quite high. They're expected to ship by the end of January, may pets and colleagues be warned. >> Buy the USB MSN Missile Launcher at Brando. >> Watch the video of a whole battery of similar missile launchers. It's not unusual for teenagers -when their parents are out on holiday- to invite a few friends over for a modest house party. The same idea came to the mind of Australian youngster Corey Delaney when his parents were visiting Queensland. The 16-year-old spread the word about his party via MySpace and Messenger, but little did he expect this marketing strategy would draw more than 500 people to his two-storey home last Saturday night. Some of the 500 alcohol-fuelled teenagers then went on a rampage, vandalising nearby houses, gardens and... police cars. Police were forced to bring in the dog squad and call for helicopter assistance to disperse the throng. The story was picked up by the BBC and CNN, and the unrepentant boy was even asked for an apology live on television... but refused. The most painful consequence of the party gone awry, however, is the bill for an estimated $20,000 damage the revelleres have caused. Issued to Corey's parents. So think twice before you advertise private festivities in your Personal Status Message. Friends of friends (...of friends) might come and "crash" your party.